The new "Rod Ruler" from Coleman makes measuring your tie rods, trailing arms, upper third links and other linkages with rod ends simple and quick. It will measure 5/16", 3/8", 7/16", 1/2", 5/8" and 3/4" rod ends all with one tool. Save valuable time at the track by setting up all your linkages including your spares ahead of time. No more fumbling with tape measures and trying to guess the center to center distance. With the "Rod Ruler" there is no guessing, the stepped boss automaticly aligns the rod ends on center. 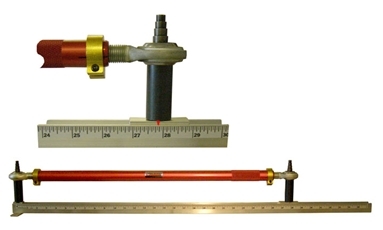 This unit is also capable of measuring linkages with springs up to 5 1/2" diameter such as torque absorbers. Measures up to 36" long linkages.